2012-01-26 - The foundation stone of the Nelson Canal Hotel was laid on Thursday by the mayor of Molenbeek-Saint-Jean, and the private investors responsible for finding a new use for this part of the famous Belle-Vue brewery. In 2009, the Municipality of Molenbeek and three Brussels investors (Christophe d'Ansembourg, Nicolas de Bellefroid and Jean-Paul Pütz) purchased the canalside building near the Porte de Ninove – a familiar sight to the people of Brussels – from the InBev Belgium Group. Their ambitious plan was based on a shared desire to put the building to new use and give it a future rooted in the regeneration of this district of the capital. · For the Municipality, this represents an innovative project combining urban regeneration, the effective use of the industrial and historical heritage, energy performance (a model building), socio-professional integration and the image of Molenbeek-Saint-Jean as a tourist destination. The site will be the location for the Belle-Vue Hotel Centre. Specifically, this will feature 29 hotel rooms, a seminar room and rooms for hotel and tourism training. This large-scale project is being developed with the support of the European Union (under the ERDF programme 2007-2013), the Federal State (the Large Cities Policy Programme) and the Brussels-Capital Region. Work should start in spring 2012. 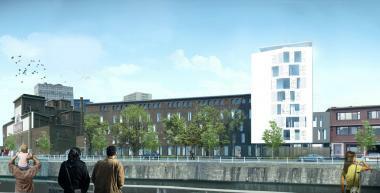 · For Nelson Canal, the project combines a hotel operation, accommodation and leisure. In the main building, a low-energy 150-room hotel will be created. The German hotel group Meininger will take the lease on the building and operate its hotel concept for young people and young families. The group has some 15 hotels, mainly in Germany and Austria, but also in London and, shortly, in Barcelona and Amsterdam. Its arrival in Belgium marks the continuation of this success story in the alternative, high-quality hotel sector. A building consisting of 14 passive dwellings will also be built. The landscaping of the grounds of the hotel and dwellings should showcase the hotel’s architectural heritage and give the site a more open feel. Finally, the third building with the famous façade bearing the Belle-Vue Kriek advertising sign will be used for shows, concerts and the arts. The work is scheduled for completion in mid-2013. Description (alt): A view of the future floating hostel.